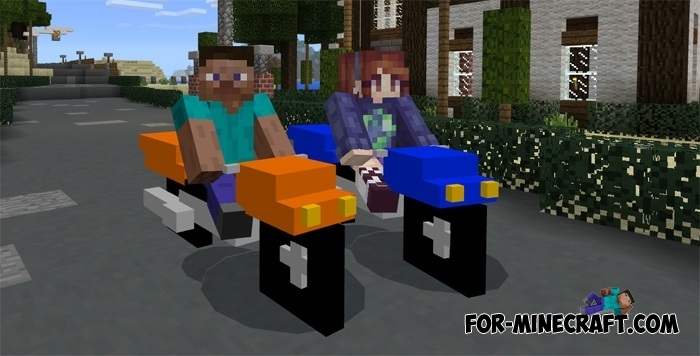 Yes, this is another transport mod for Minecraft PE, but it has a small difference. Now you get three bikes in different colors (it is very difficult to call it a motorbike if you look at the screenshots) with square wheels. Each bike has the same characteristics and speed, so you just have to choose your favorite color and start driving. There is a new and unique opportunity to ride together on one bike. The second player can sit behind the first one. Now you can use armor as additional parts. The speed of all motorcycles was increased. Many new colors and items such as key, fuel cans and stuff. Added 2 new motorcycles (black and white). All bikes have a new appearance (look much better than before). Actually this thing is very similar to a quad bike, but author has decided differently. The bike will be useful to you if you are a traveler. How to get a motorcycle? There are no crafting recipes, the only way is to spawn them (throw a skeleton, wither skeleton or stray spawn egg). Then take a carrot on a stick and sit on the bike. That's all, after that you can control your vehicle. If you need a car then download Jeeps mod for MCPE. You get detailed car that perfectly replaces horses. 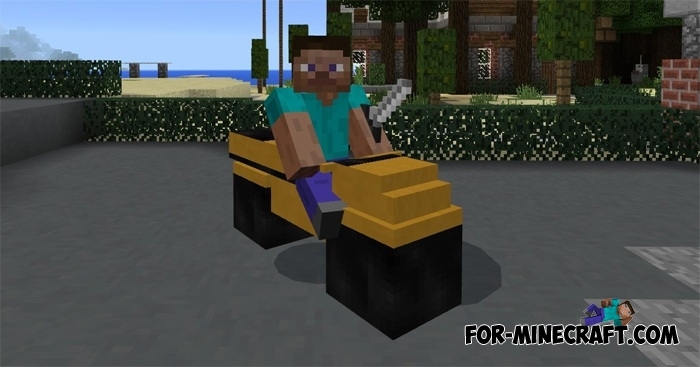 How to install the Mine-Bikes mod? Download the archive and extract two files. Start the game and go to the world settings.